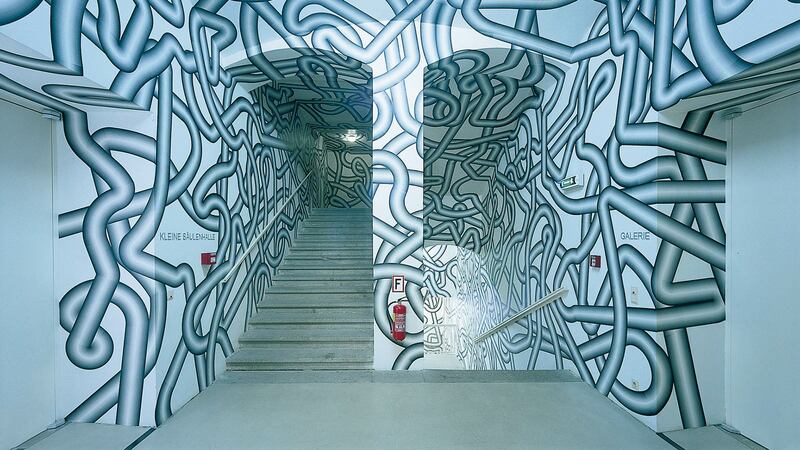 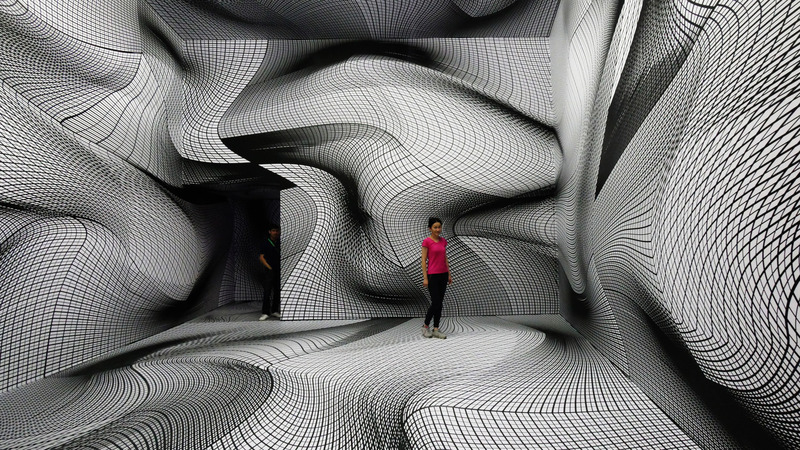 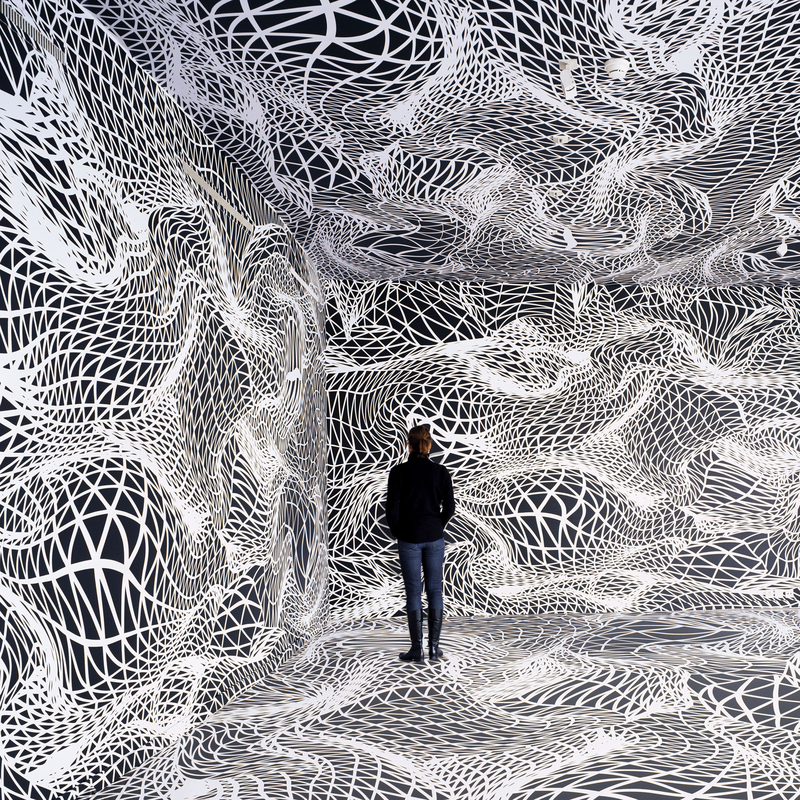 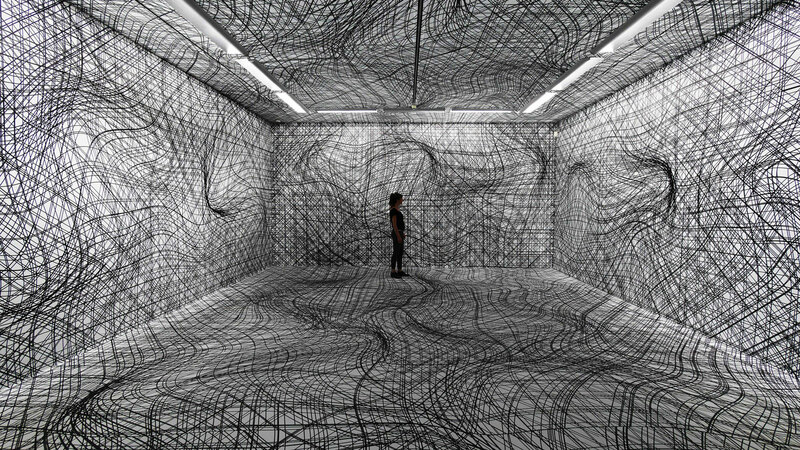 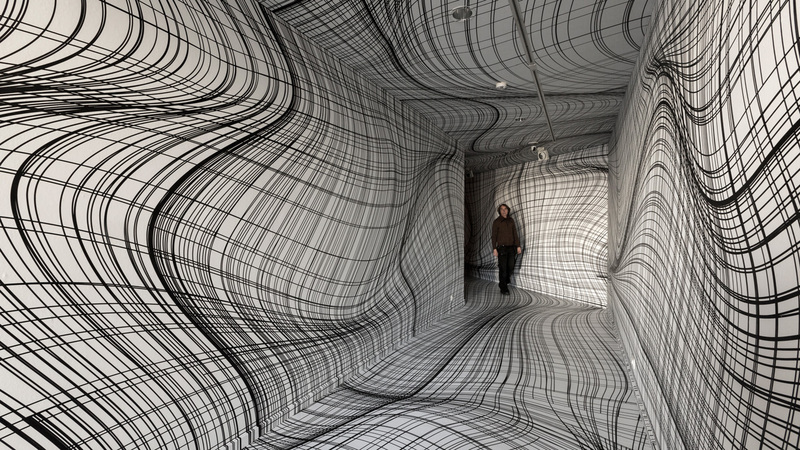 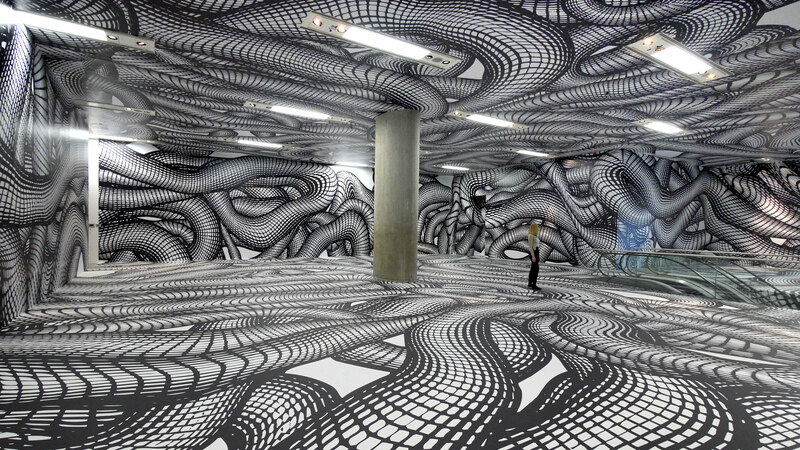 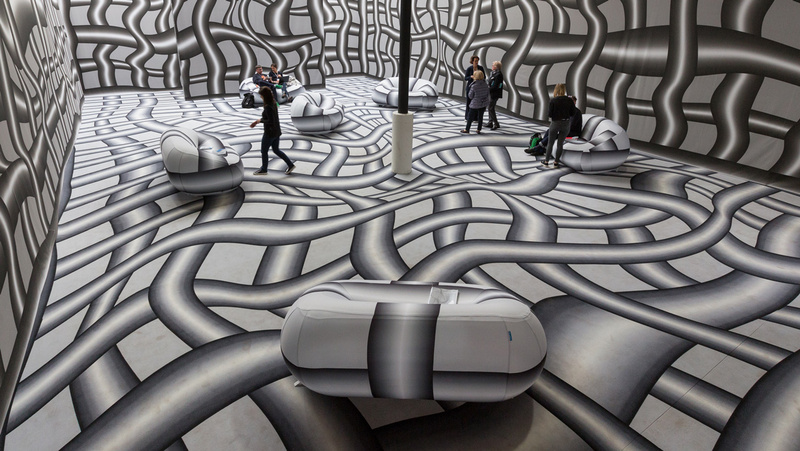 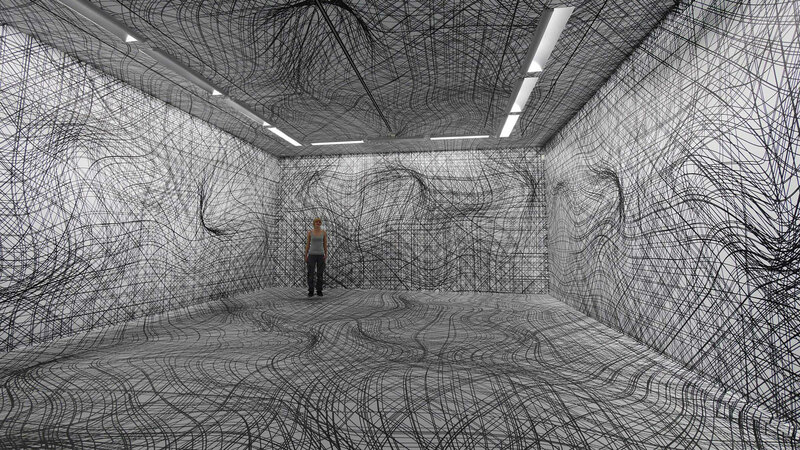 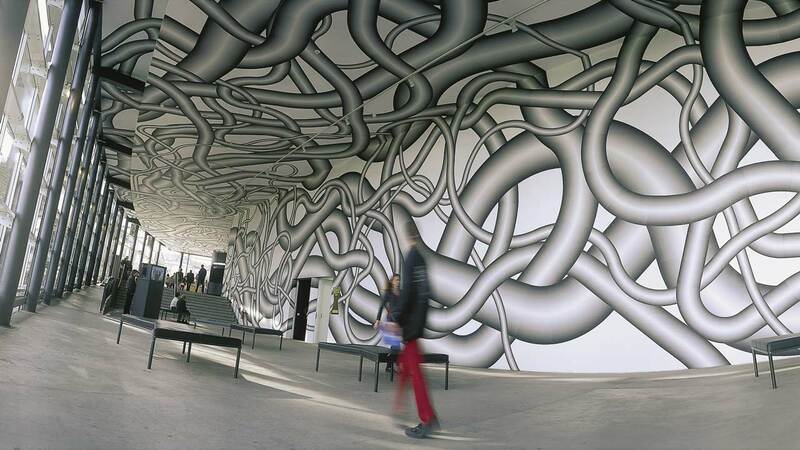 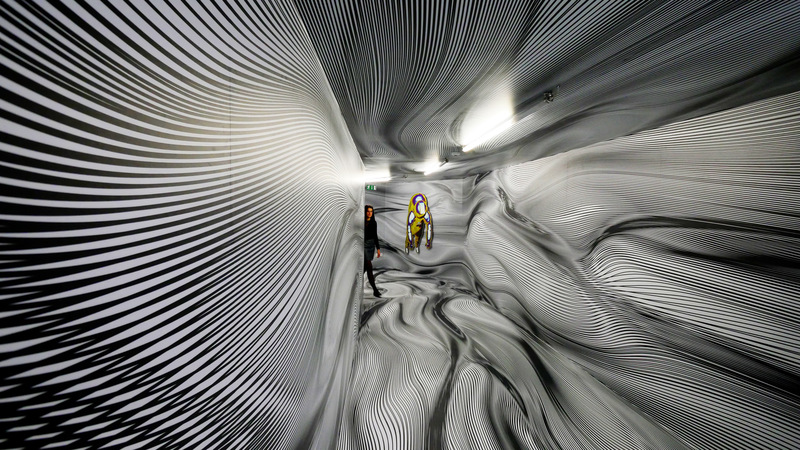 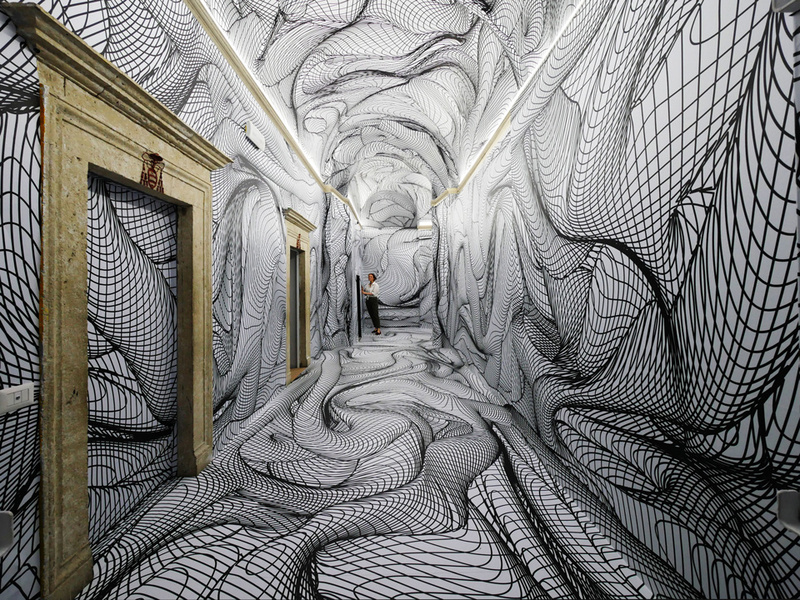 Peter Kogler is a renowned artist from Austria that currently works and lives in Vienna. 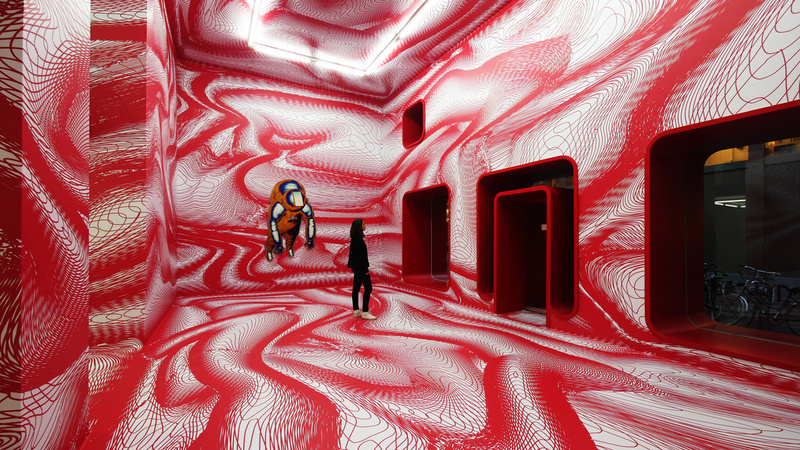 Kogler is best known for his different psychedelic room installations. 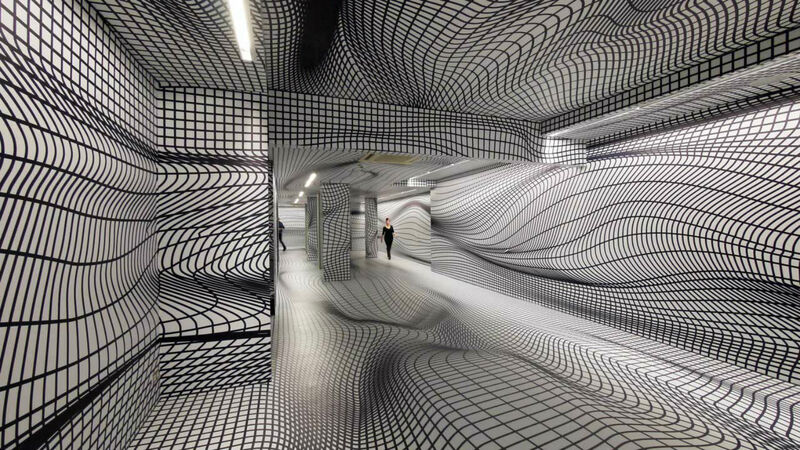 Through his paintwork and his intricate projections, he transforms ordinary looking rooms and spaces such as lobbies, galleries, and transit centers by making them look twisted, warped or distorted, which in turn has a psychedelic effect for the public. 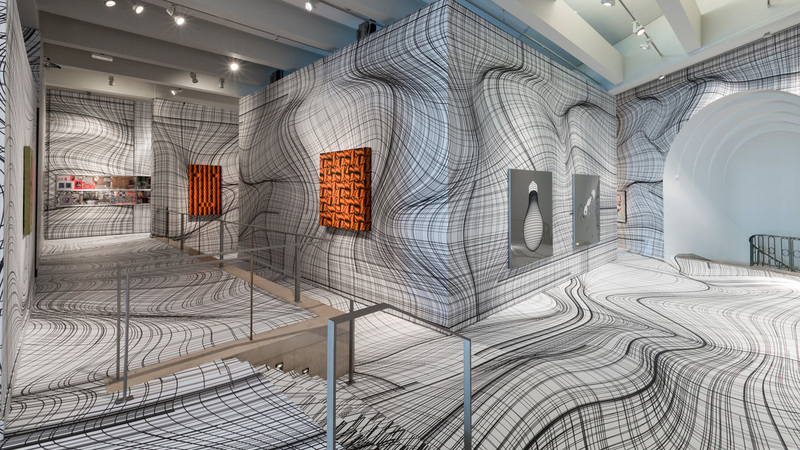 Kogler was born in 1959 but is today regarded as a famous pioneer in the field of computer-generated art. 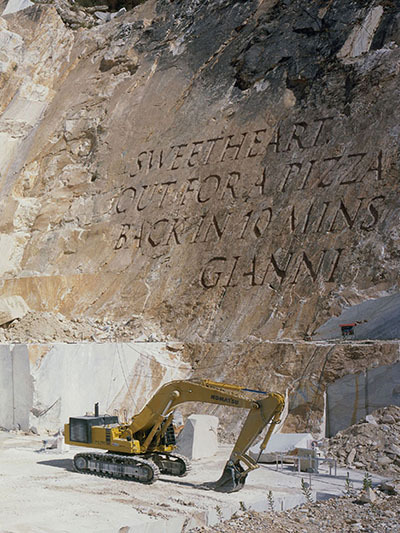 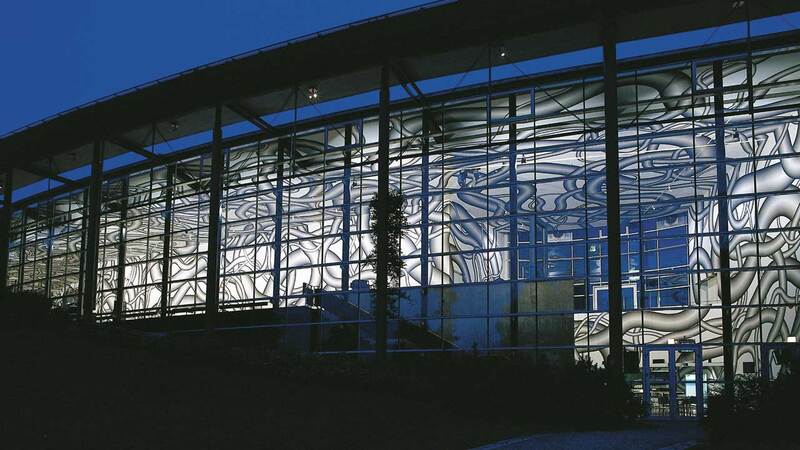 Although his work spans decades (more than 30 years) his installations continue to improve regarding design and depth, which has allowed him to experience success throughout his career. 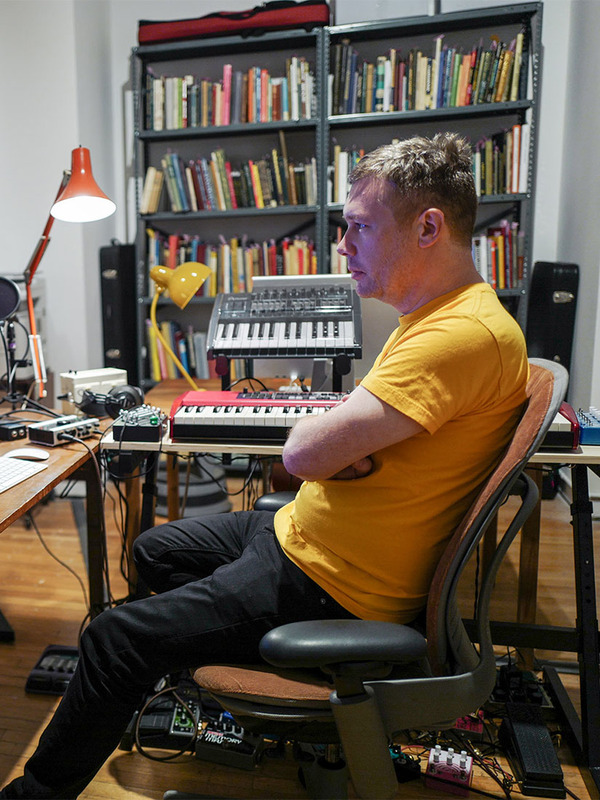 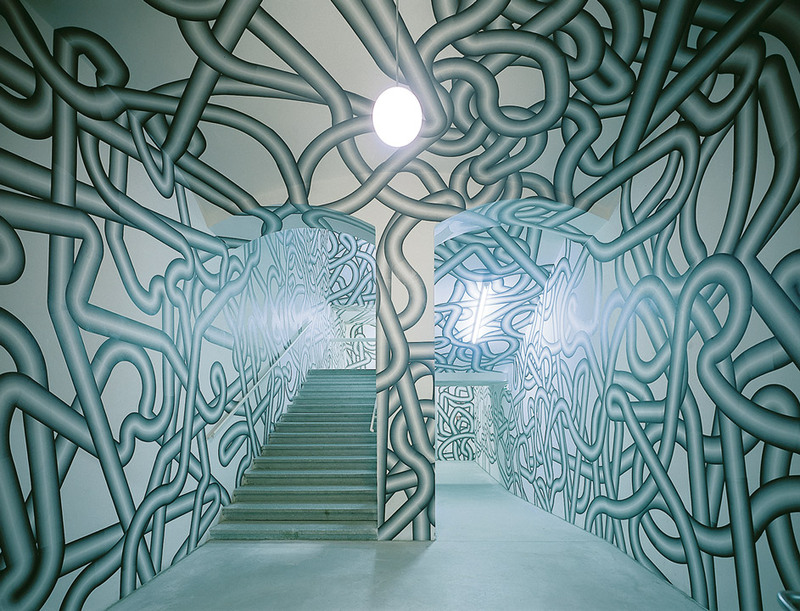 At the start of his career, he dabbled in painting and experimental filmmaking but settled on computer technology in 1984. 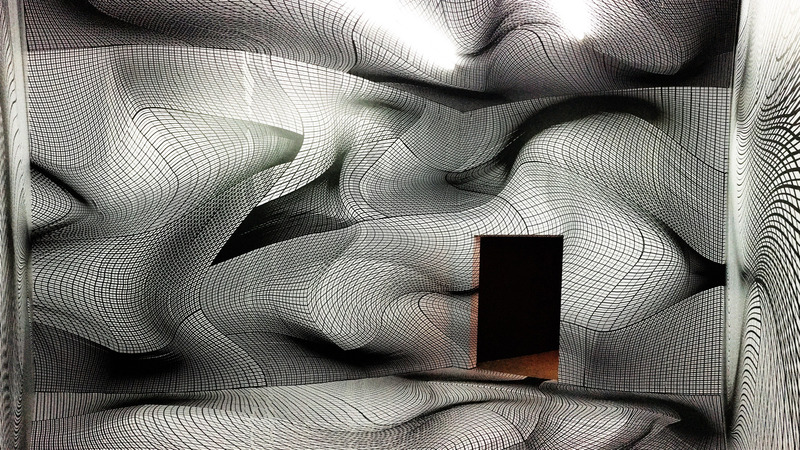 Kogler’s room installations explore vital concepts in his art such as modularity and repetition. 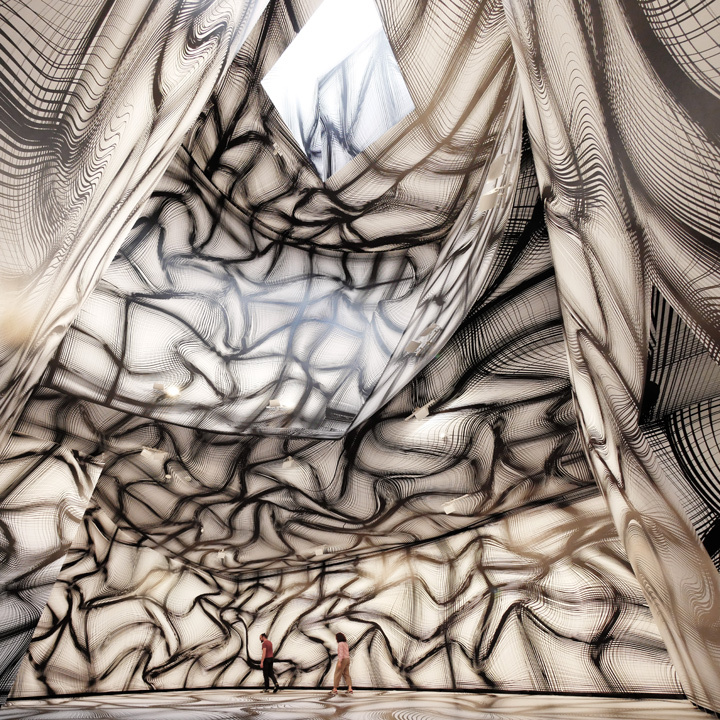 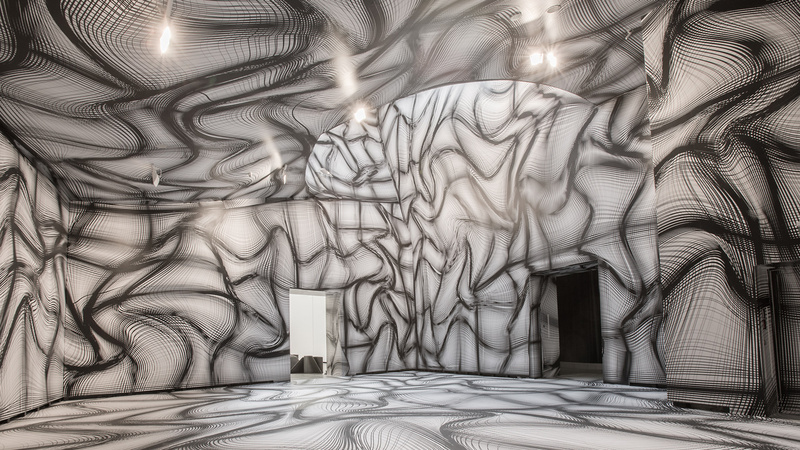 The rooms alter one’s perception of architecture, which serves as the primary medium for his art. 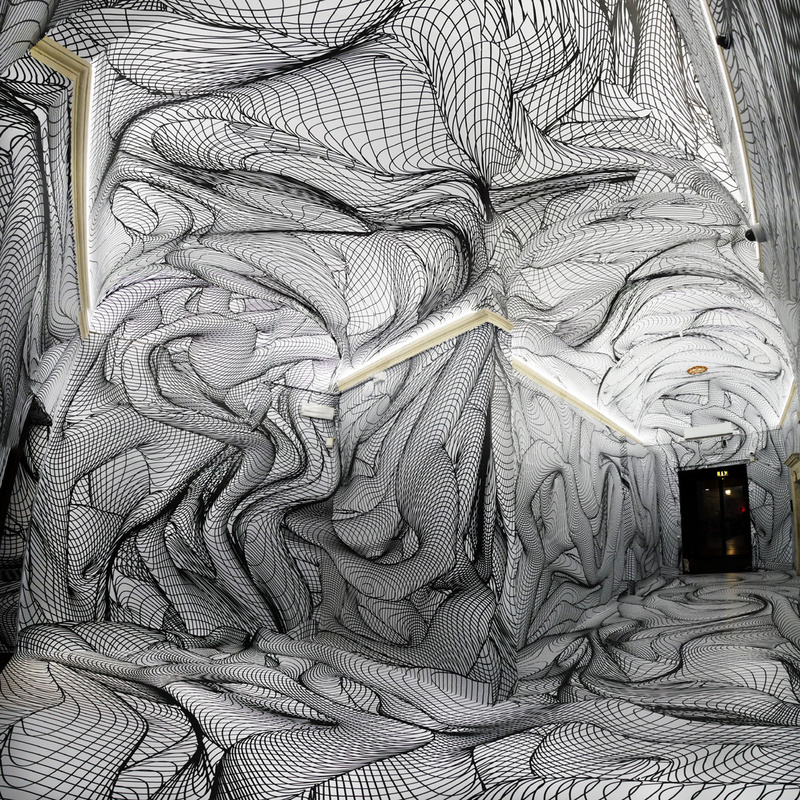 Aside from his dizzying rooms, Kogler is also a performance, film and video artist as well as a sculptor. 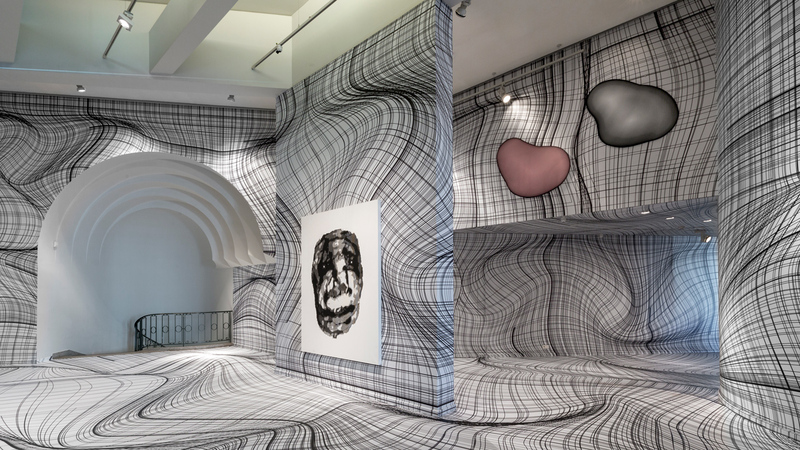 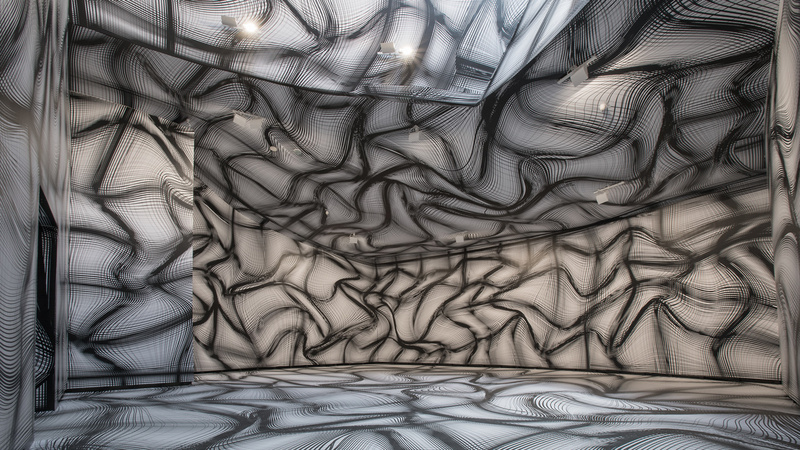 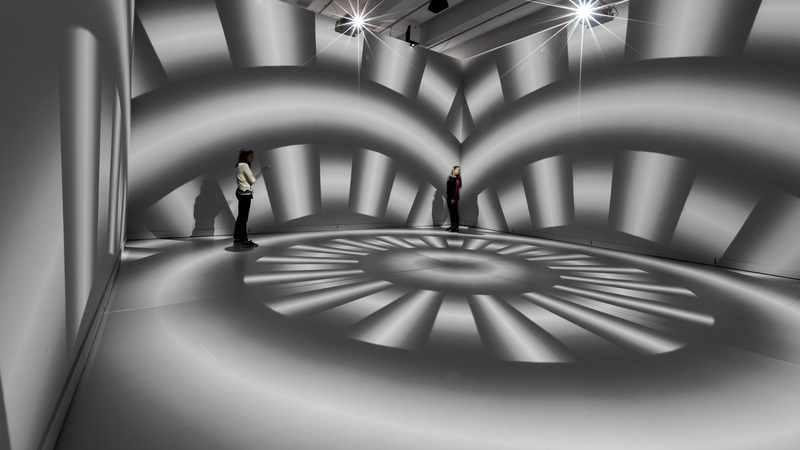 For his Rooms installations, Kogler essentially uses hypnotizing line designs to affect the viewer’s perception in unique and unnatural ways. 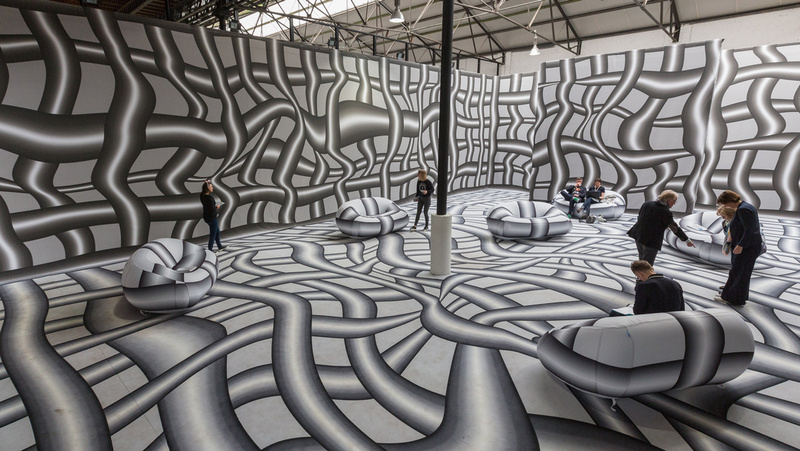 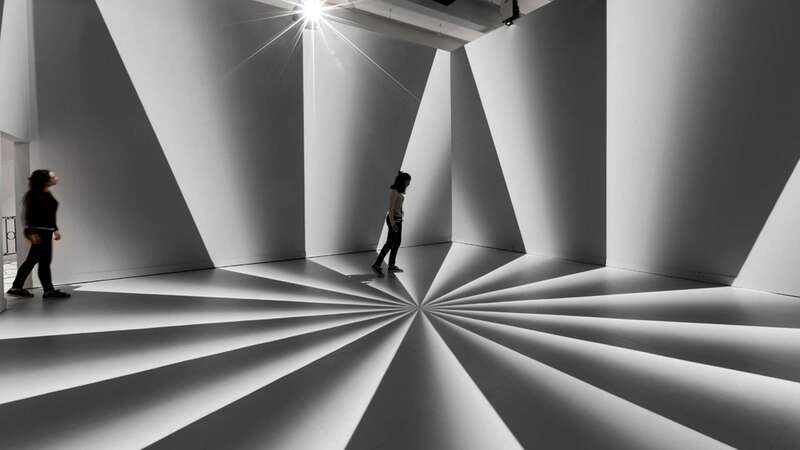 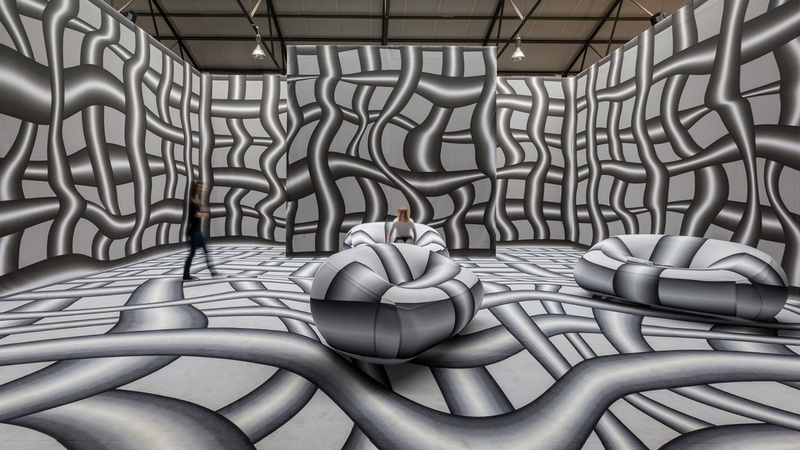 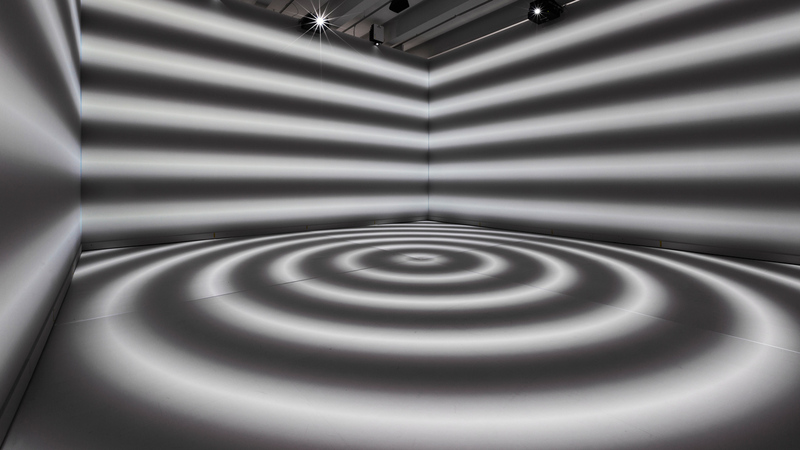 He transforms ordinary spaces into virtual mazes with different interesting lines, creating a feeling of undefined movement for everyone that experiences his various room installations. 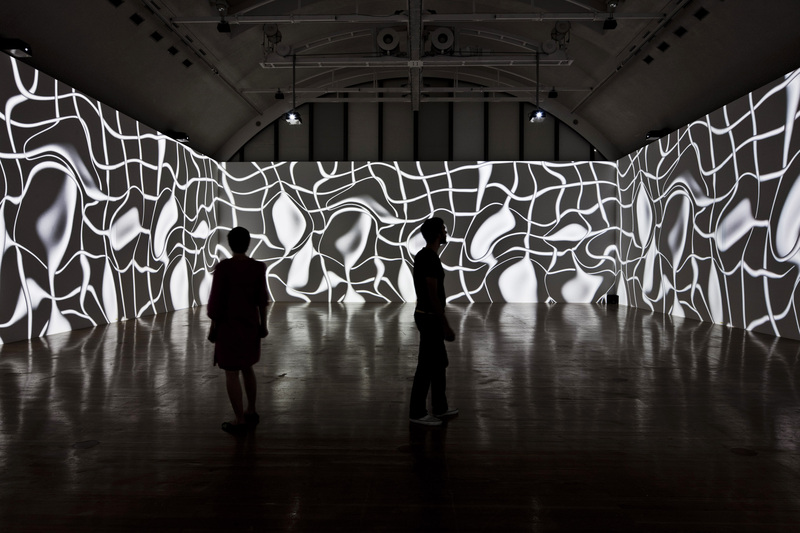 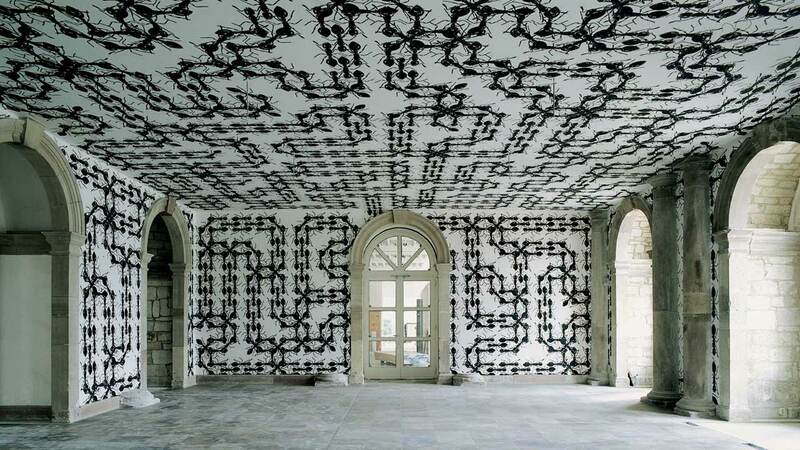 Most of his room installations are mainly 2D in nature, which also allows them to be more eye-catching and engaging. 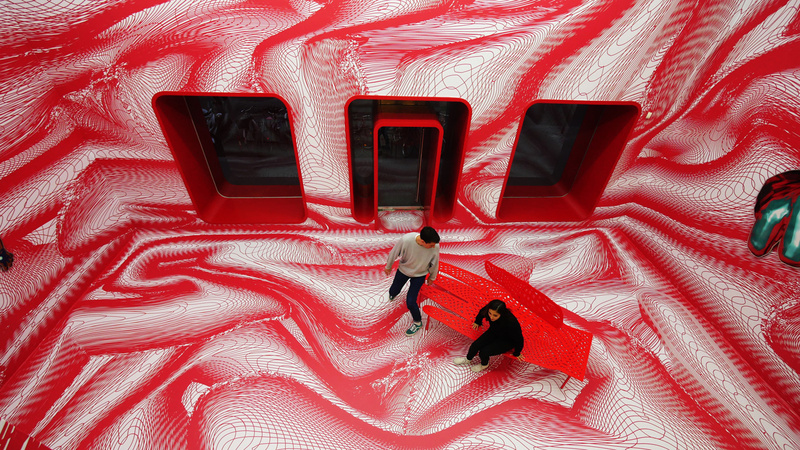 They do a great job of inviting the user to interact with their surroundings and allow audiences to view old environments in new and unforeseen ways. 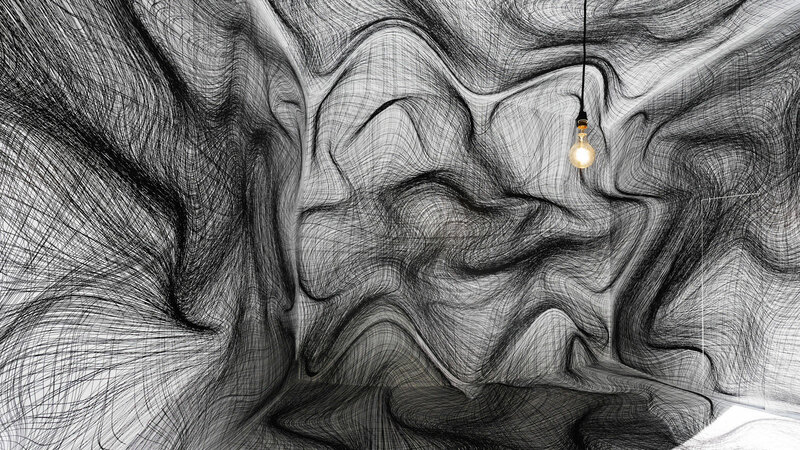 Most of the backgrounds that he prefers to use are white, and the intersecting lines are often bold. 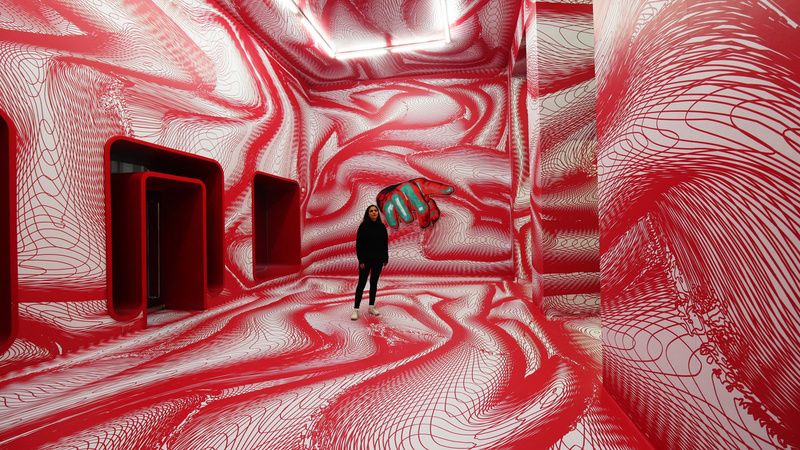 To ensure that the audience indeed gets lost in his installations, he mixes whites, blacks, and sometimes reds to create stark contrasts that generate a dramatic illusion. 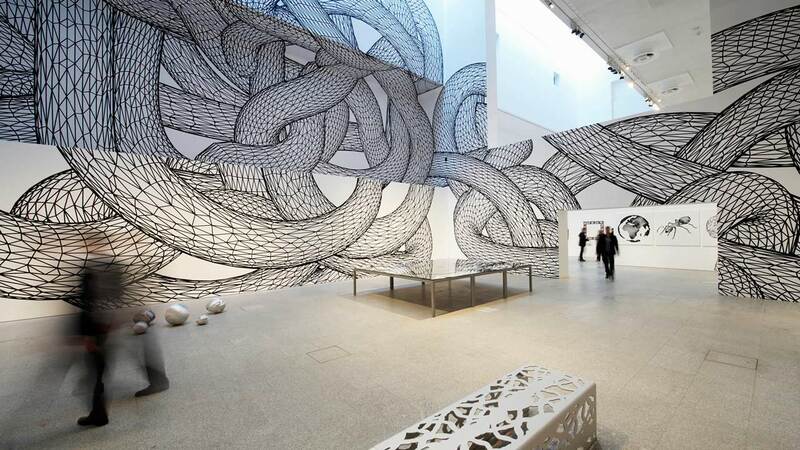 Aside from lines, he also uses geometrical elements similarly. 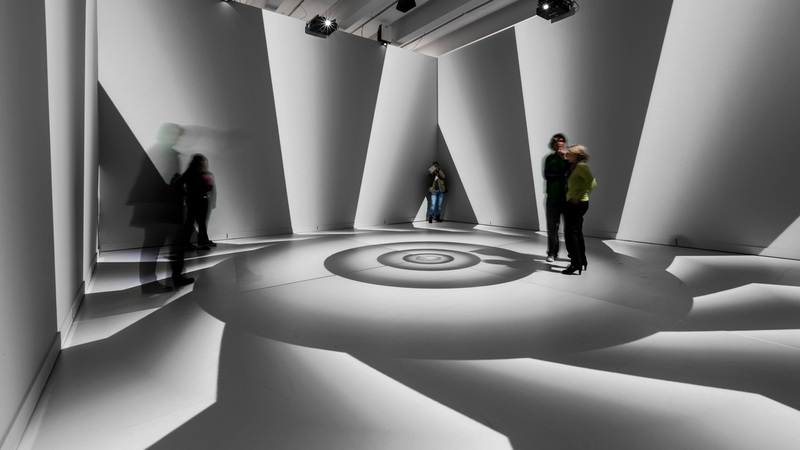 With each work and each viewer, the experience and perception are different and unexpected, which helps to make the room installations fascinating for anyone that experiences them. 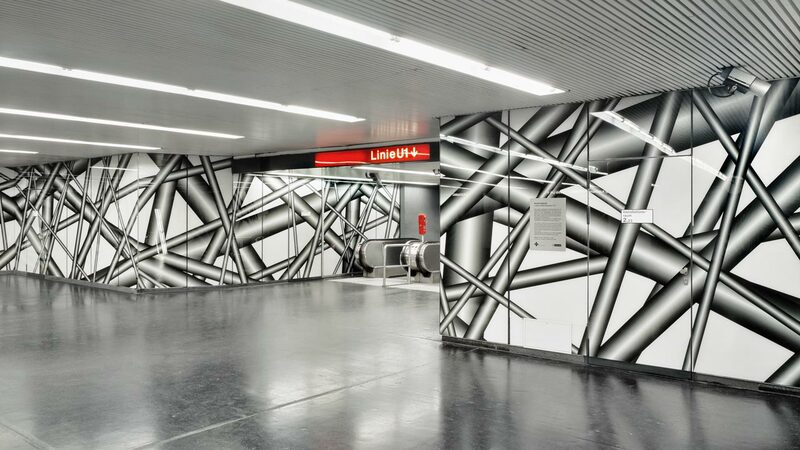 His multifaceted style complements whichever medium he uses, whether it is an art space or a subway station. 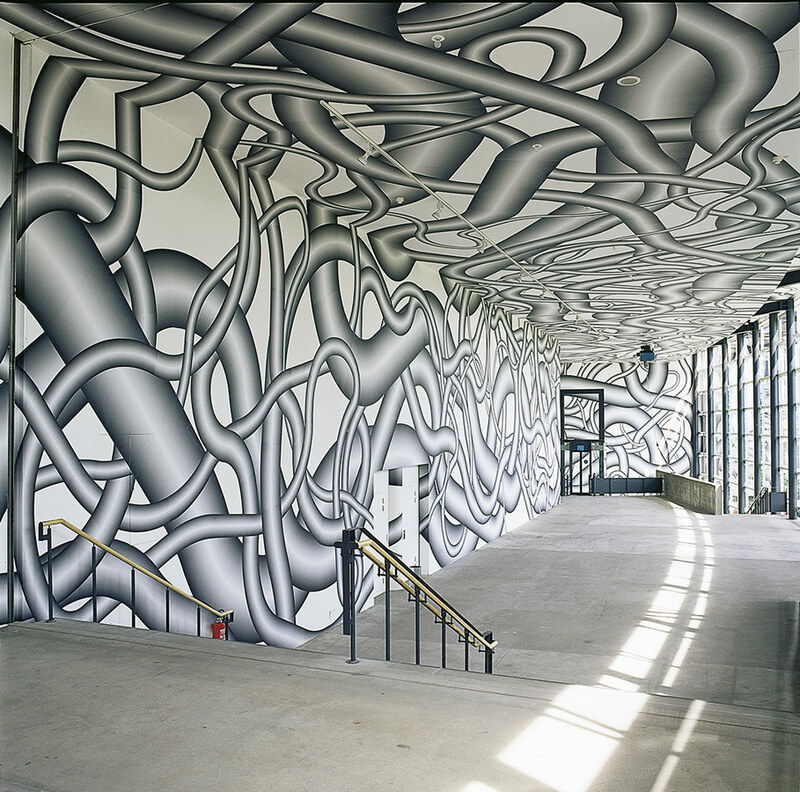 Kogler’s works have been featured in numerous collections and museums as well as in popular public spaces across the world. 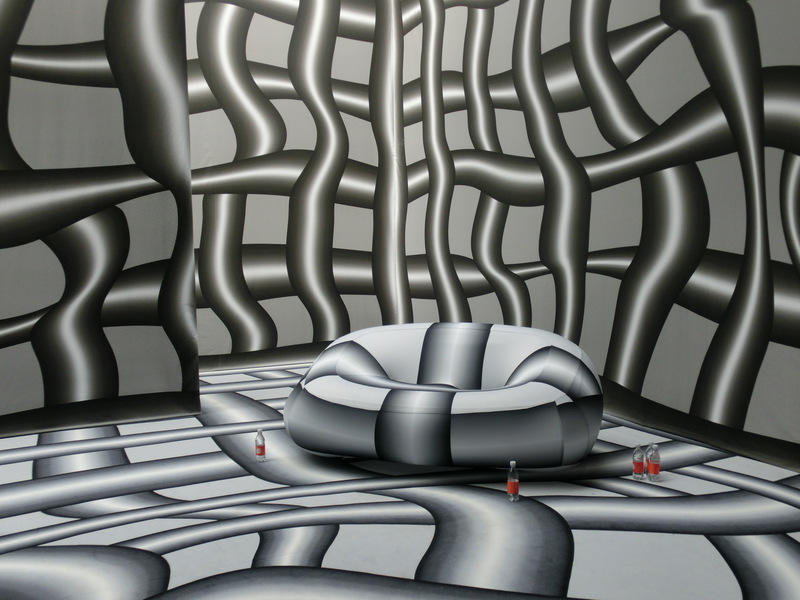 Because of his unique approach, he has managed to create an absorbing and impressive composition of works. 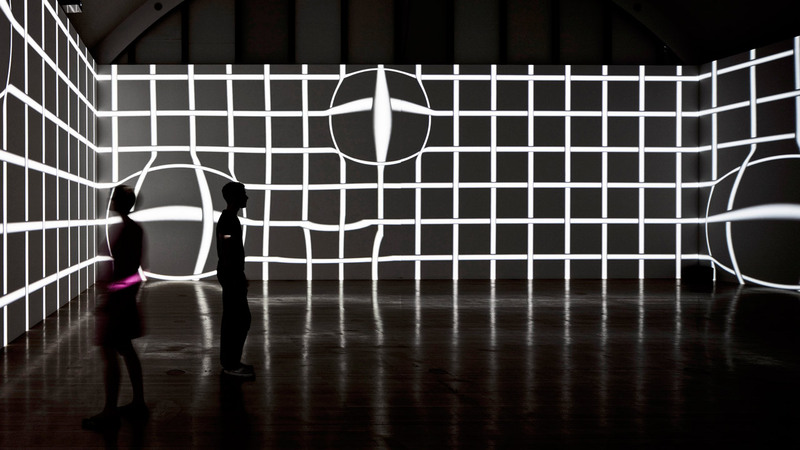 All images by Atelier Kogler/kogler.net unless otherwise noted. 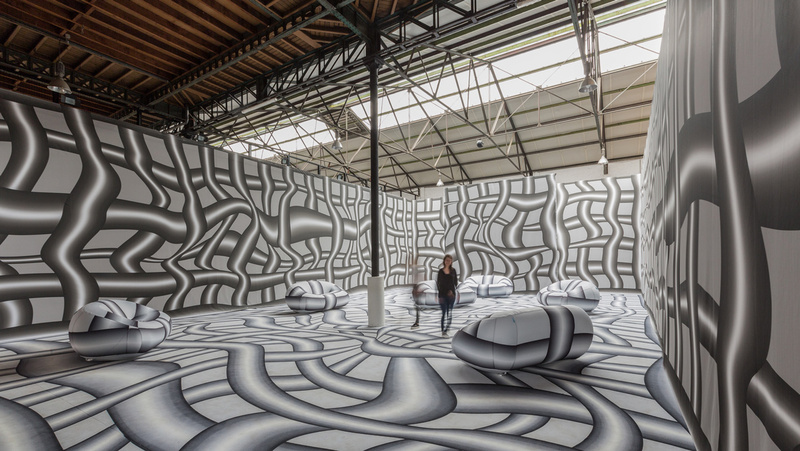 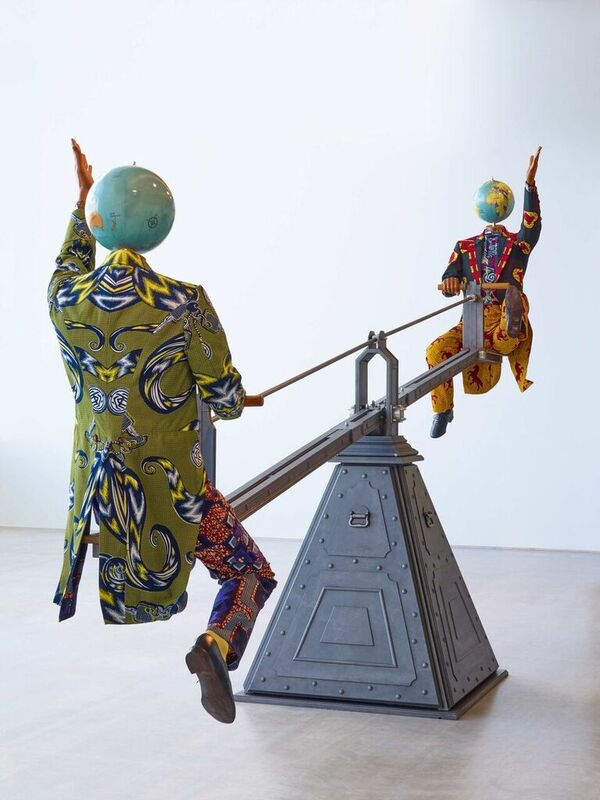 Posted on March 8, 2018	in the category Installation and tagged Architecture, Art in Austria, Art in Istanbul, Art in Kassel, Art in Paris, Art in Vienna, Astana, Brussels, Dirimart, documenta 10, documenta 9, Frankfurt, Museu Coleccao Berardo, Museum of Contemporary Art Zagreb, Peter Kogler, Portugal, Schirn Kunsthalle.